Joe shares with us the history of his GT500 KR. He has done an excellent job putting all the pieces back where they belong. Joe was always a car guy. His father owned a sucessful radiator repair shop. Today Joe carries on the family business. The list of cars Joe has owned is nothing short of incredible. It includes Galaxies, Comets, Thunderbirds, Torinos, Cougars and Mustangs. Like Joe, his dad was always in the market for a good deal. He bought and sold many cars over the years. Joe distinctly recalls his dad passing on a Shelby. "Who the hell would ever want put a big V-8 in a car like that ?" his dad asked. "That car will never sell". No doubt, it was at that moment a seed was planted. Sometime near the end of nearly nine months of Shelby production, a lime green, 1968 GT500 KR would arrive at AO Smith. The car would become # 4352. The state of Arkansas did not have a franchised Shelby dealership, but this car would end up at Pine Ford in Camden, Arkansas. The original owner, Ernest Hendricks, traded in his 1966 Mercury Cyclone. That was in early 1969. This is a picture of the car with Mrs. Hendricks . After two years, Ernest would trade in the big block for a more practical family vehicle, a station wagon. The second owner was only 18 years old when he bought the used Shelby from the local Lincoln-Mercury dealership. It didn't take the young man long to fully experience the power of the awesome Cobra Jet engine. He managed a meeting with a few pine trees. The damage to the car was minor. I guess the boy's father could not have been happier when the C-6 automatic transmission started slipping. That along with several tickets meant it was time to park the car. Shortly there after it would be traded in for the second time. By 1977, the car had found its way to nearby Kansas. The heads and intake manifold were in the trunk and the driveshaft was in the backseat. The new owner, stored the car never putting it back on the road. It sat in the same building for 15 years. When the lease ran out in 1982, the car was moved to another storage facility. 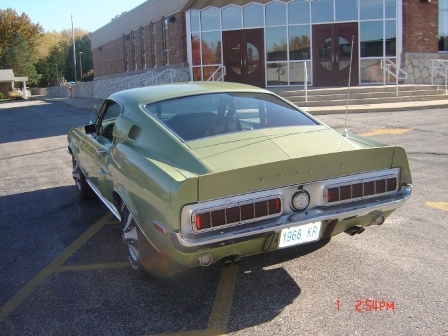 The old green muscle car sat there for another 15 years. By now it was 2007. 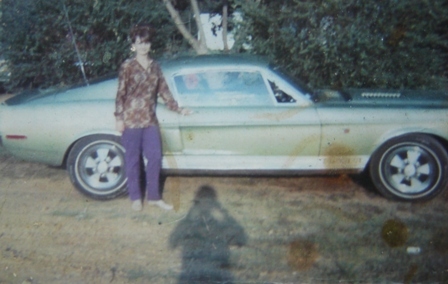 After 30 years of storage, there was a lime green GT500 KR on Joe's radar. It was Joe's son that had located the car. They were looking for a father-son project. After passing on a clapped out Charger, they found the Shelby. The first thing that came to Joe's mind when he saw the car was "who the heck would put a big V-8 in a car like that?" Actually, the car had been sold when Joe went to see it. Luckily, the deal fell through and Joe was ready with the cash in hand. He also had to convince the long time owner, he was going to get the car road worthy and hang on to it. He did. Joe didn't realize the diamond his young son had found. Once Joe got the car home, he inspected the underside. He was surprised to see a heavy coating on oil. The original owner was concerned about driving on gravel roads, so he repeatedly slathered the chassis in the heavy oil. The more Joe looked at the car, the more he was convinced, he had the makings of a true "survivor". Joe had no problem rebuilding the engine and transmission. That combined with a little sprucing up has made the car ready for what it was originally intended . . . good, clean, fossil fuel burning fun !